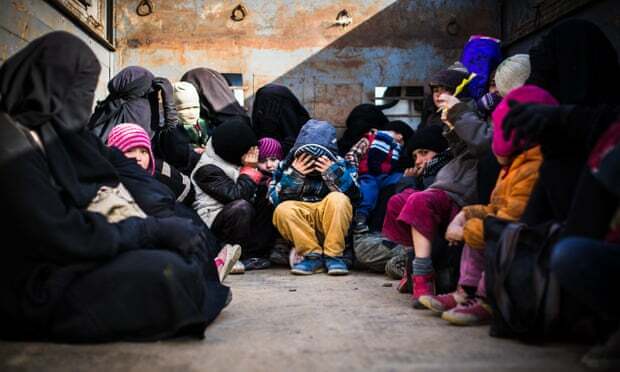 The Guardian: An estimated 7,000 women and children from more than 40 nations, including the US, UK, Australia and Europe, are living in tense and chaotic conditions in camps in north-eastern Syria, where they are “not wanted” due to their supposed affiliation with Islamic State. To ease potential tension among the many groups, the foreign nationals – hailing from countries as varied as Indonesia, Kyrgyzstan, Somalia and Trinidad and Tobago – have been segregated into separate annexes in two of the three camps, which include Ain Issa, al-Roj and the severely overcrowded al-Hawl centre, where Shamima Begum’s baby son died just under a fortnight ago. Up to 5,000 children in the camps are believed to be foreign nationals, according to Save the Children’s Syria response director Sonia Khush, a figure that does not include Iraqi children. But the exact numbers are difficult to assess, said Khush, due to the sheer number of people arriving every day. Some 58,000 newcomers – 90% of them women and children – have arrived in the past three months alone, many of them from the last Isis enclave of Baghuz, said Ghassan Mediah, who heads the Unicef field office near al-Hawl, close to the Iraq border. There have been 123 deaths, including 108 children, on the way to al-Hawl camp or soon after arriving, according to the International Rescue Committee.